There are thousands of videos and blogs on how to do this, so I will get down to the WHY behind my decision. There’s a piece of me that blames you. 🙂 In this time of sharing what I’ve learned and love about having natural hair I began to miss my hair like crazy. Even the business cards that I’ve been covering the world with have a great big fluffy, perfectly imperfect Afro. I just couldn’t take it anymore. The versatility of loose natural hair is what made me fall in love in the first place. Even in the in-between stages, there are so many styles, twists and pin-ups that keep you feeling cute and sassy. 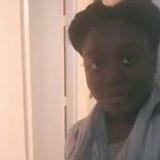 I felt like I looked like Celie (Color Purple) every single day I woke up. I have very strong Motherland features, so it doesn’t take much to make me look like Addy (American Girl). The individuality of loose natural hair was another love point. It’s hard to find someone with my “hair style”. Even if we are styled the same, my texture brings in my own flavor. 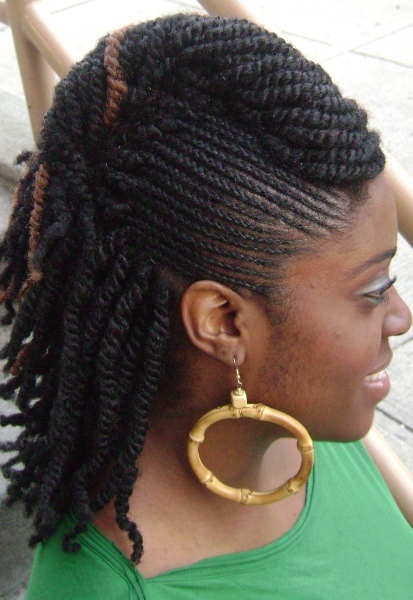 I walked around with my locs, and it seemed like everybody in the world had not just my hair…. but a better version of what I was trying to do. It drove me insane. Lastly, I had a bad case of Hand in Loc syndrome. I’ve styled and played with my hair ever since I can remember. (There’s a few photos of me at age 4-6 standing on the bathroom counter with my hands in my hair… I’ll try to get Mom to dig them out.) I hate to know what I’m going to look like day in day out. I need to be able to match my mood with not just my outfit, but my hair. It’s hardwired into my DNA, I’m certain. Great big deal: most of my outfits were selected with the Fro in mind, so the locs just messed up the lines visually and detracted from the over all Stun factor that I was going for. I spent my excursion in Toronto feeling BLAH. That’s no good. In all I appreciate what I was able to learn from my 6 months. I had to just deal with my insecurity and own it. I found a way to activate my inner Diva, even though I never felt like the outside matched. I didn’t hide away in the house. I traveled and met new people both things that I used to have a hard time getting comfortable with, believe it or not. My locs made me fearless and for that I’m grateful. I just needed to have my hair back. As always, ask questions when it stops making sense. Thanks for staying on the path with me. I’ve had a chance to work on the product line more and my test subjects are in LOVE. Still working out a few kinks 😉 but I hope to bring you something that you’re going to absolutely LOVE. Because you deserve it. We received a great question from one of our readers this week that is natural, but looking to explore the wide world of weave. Let’s break this down into sections. There are two parts to care for in a sew-in. The hair that grows, and the hair that shows. The hair that shows most likely comes with instructions for care. There are many types of hair extensions so for that, just be mindful of the packaging. The hair that grows needs to start off strong. I suggest a deep conditioning treatment immediately prior. Throughout the life of the style, the scalp should not be left to dry out. Remember that the string in this style is most likely made of polyester which will absorb the moisture from the braids at the base. If you intend to keep the style over a long period of time, I suggest professional assistance when cleansing. A sew-in is a great alternative when applied properly. Know the difference between secure and tight, and do not ignore the signs of undue tension like small white bumps at the hairline, severe pain, or the inability to make facial expressions (we’ve all been there). Overall, a sew-in will provide the flexibility to style with heat, forget your scarf here and there and play a bit more without worrying so much about daily damage. 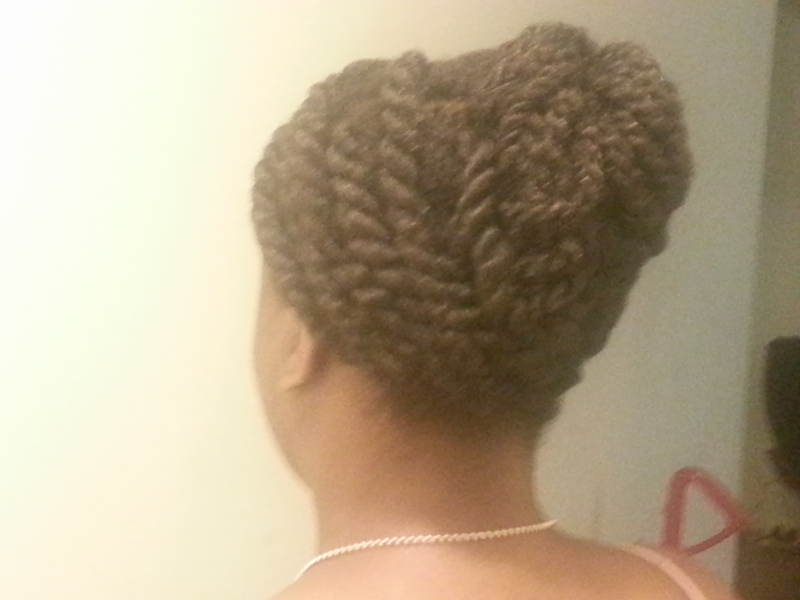 This can count as a protective style, if it is applied correctly and professionally maintained. Try it! Thanks for asking questions folks, keep them coming! In the natural hair community, you hear lots of people throwing around the term “protective style”. This term has been attached to some pretty damaging styles so let’s break down what needs to be taking place to qualify. Condition 1- Moisture is not being rapidly drained from the hair. Synthetic hair and wood products wick away moisture from your hair. Condition 2- The hair is not being pulled at unsafe tension levels. Pulling hair too tightly in braids can cause the hair to fall out in the high stress areas. 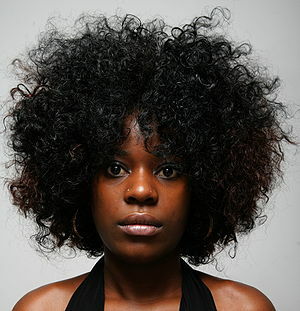 Condition 3- There is not a daily duty to constantly re-style and manipulate using heat or a comb. Excessive flat ironing or combing around edges of weaves for “blending” purposes leaves your hairline still in jeopardy. We spent a little time on YouTube this weekend and noticed that there were some tight twists, mock locs, yarn wraps and weaves being labeled as protective styles. It’s not so much that they were incorrectly labeled, as they were not accompanied with the level of information that a newbie DIY hair Diva needs to know. Moisture regimens as well as how long to keep a particular style with a particular medium (fabrics, synthetic hair, etc.) were all missing from some of the Kitchmatology tutorials. By no means are we saying stay away from, weaves, braids or wraps. We are saying remember why you’re getting the style in the first place. There may be instances that you have a style that you need to achieve for a certain occasion and in many of those cases you won’t keep the style for long. But if you are seeking a protective style for the purpose of giving your hair a rehabilitative break, keep in mind the points listed above. Remember you want to send your hair on vacation, not a work trip. We love the style posted above by the way! Versatile, extremely low maintenance, and hair is available to be thoroughly moisturized. As usual, ask questions when things stop making sense. Enjoy! Here’s a tip that I remember from my first summer of being natural. 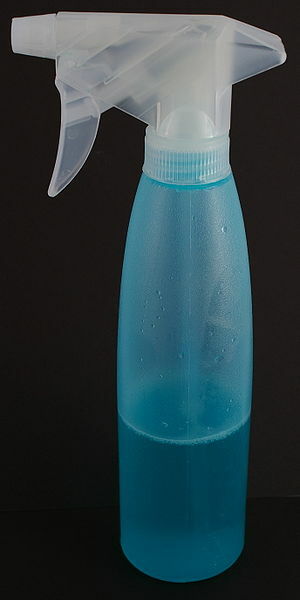 Buy a spray bottle that will fit in your purse and each day fill it with your favorite leave-in conditioner and a small amount of water. When you’re wearing a English: A spray bottle.style that tends to dry out through the day, use this mixture to bring your hair back to life. When I heard this piece of advice, the only thing that I could think or see in my head was the image of the 1980s Curl Craze epidemic that had people spraying activator on their heads constantly, tearing up the furniture. However, a take-away from that dark moment in Black History is the fact that we had a grasp of the importance of moisture in the growth cycle of our hair. Hope these give you a few ideas. Try your own recipe. If you would like to use essential oils in your mixtures opt for a colored bottle to reduce sun exposure. If you can find a plastic amber-colored bottle or one that does not allow light to pass through in general. An aluminum bottle is suggested only if you have perfected your mixture in a see-through container. You want everything to blend well before you spray it to avoid clogs and uneven distribution. As always ask questions when it stops making sense. Enjoy! Let’s start off acknowledging that there is no such thing unless it’s a bonnet with unbearably tight elastic. The lies people tell to sell product is unreal. We tried this contraption which is sold at the superstore that shall not be named “W____art” and there has been a nightly struggle to wake up and find the thing ever since. My suggestion would be to use a variation of a loc-sock to keep your hair covered at night, or break in a satin bonnet and see how that goes. Those hair store square satin scarves will work much better than the long rectangle. I purchased the no-slip scarf because I needed something to line my hair for a decorative scarf style. The first day wearing it, I ended up with a massive headache because the stretch material pulled much more than I anticipated. It was a subtle but steady tightening, which ironically is what caused it to come off my head by gradually slipping back. I would have faired better getting satin bedding and pillow cases, at least then the only thing I’d have to worry about are the fitted sheet popping up on the ends of the mattress. I don’t ever want to bash someone’s product directly but hopefully you’ve put enough together to avoid the scarf with preposterous claims. As always, ask questions when it stops making sense. Got a crazy product story? We’d love to hear about it. MarElle rocking a twist set pin-up pre-loc journey after several haircuts. So I started this blog as a way to give back for the past decade of having natural hair. 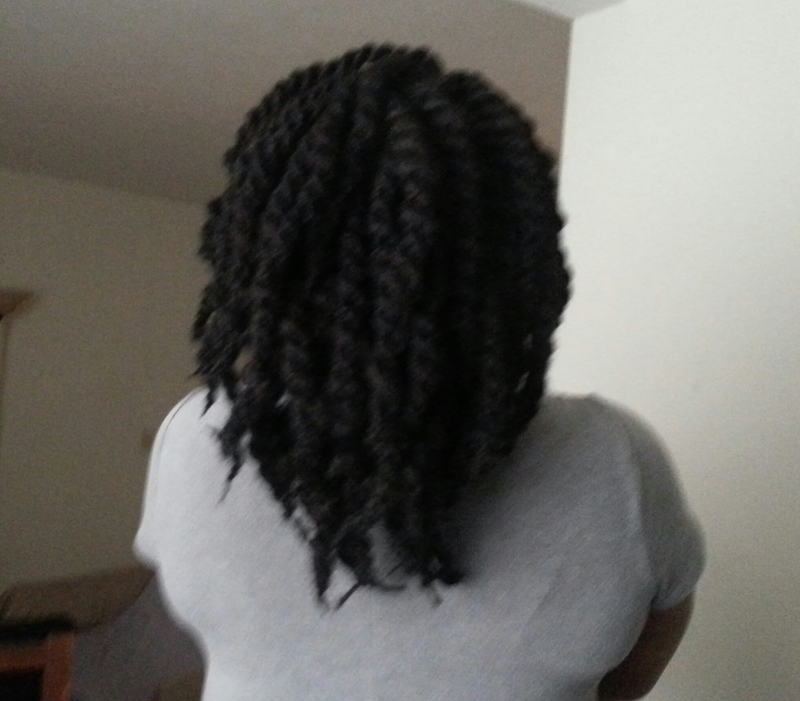 I’m starting on this journey with locs (sometimes referred to as dreadlocks). I usually am able to manipulate my curl pattern to submit to my will but this new phase in life is proving the exact opposite. I don’t believe there has been a time that I’ve been forced to “deal with” my hair quite as much as now. Maintenance: Very low, there’s not much to do. My biggest decision in the morning is headband vs no headband. I cover my hair so much more now than ever before. The Good: My hair is actually being left alone and allowed to grow. I cleanse my hair much more gently than before and I’ve reduced the amount of chemically enhanced shampoo I introduce to my scalp. Conditioner has become my friend. The health of my hair currently has not been matched in any other state. It never feels dry and my ends have a new life as the curly ornaments at the bottom of my locs. The Bad: I have been a style heavy Fro rocker for years. I honestly miss being able to do a funky pin-up and I’ve acquired a case of Fro-envy every time I see fun Big hair. I’ve had to take my own advice dished out in “They’re All Going to Laugh At You” and throw on some earrings and go. Trust me I fully understood the difficulty when I wrote that piece. The Ugly: There are some days that my hair decides that it wants to puff up/ unravel / do “The Watusi” and there’s nothing that I can do. The game doesn’t change because I’m in the loc process, hair will do what it wants sometimes and now that I don’t have heat styling tools and wet setting at my disposal I’m forced to be content with whatever happens up there. I’ve attached some photos to show my process. Usually this is the part that you ask questions when things stop making sense, but I’d love some support and advice since I’m the newbie in this realm. In the first few months of my journey prior the decision to go for the big chop I was hit with tons of BAD information. Most of it revolved around Shampoo. We helped steer you clear of lots of that info by presenting “Cleansing 101: Poo Basics”, but everybody thought it would be fun to share some of the myths. Myth 1- You need to strip the relaxer out of your hair, use a harsh shampoo daily until you start to see a change in texture. What’s really happening: your hair is getting killed slowly, that frazzled look is damage. Relaxed hair is forever relaxed, you want it gone? Cut it off… eventually. Myth 2- Start air drying your hair (not set your hair and let it dry). The truth: Yes you should reduce the heat applied to your hair, however, remember when we talked about weak spots in “Holding on to the Length”? This is where many people go wrong. Your relaxed hair may look nice when wet, especially if you’ve been getting a professional relaxer that didn’t completely eradicate your curl pattern…. but that’s still chemically treated hair. If you don’t create some type of consistency from scalp to ends you’re asking for breakage, and you’ll be wondering why. Remember, set it or blow it out. Low heat is fine, it will take a while but it will still work. Myth 3- Sea Breeze is great for cleansing your hair. The funky facts: All smells aside, there’s alcohol in it. Would you rub your scalp with Purell? Seriously. But I was crazy enough to believe (this is the early 2000’s) that it was the revolution of hair cleansing. I honestly thought that it was going to keep my Afro from shrinking. Myth 4- Dirt makes your hair grow. Reality: Leaving your hair alone and not constantly combing and manipulating allows unencumbered growth. It’s really not the dirt. I sincerely don’t care what you’re trying to accomplish with your hair, you need to knock the dirt off. Hope you are able to laugh at my mistakes and not fall into any traps. There’s a lot of “Kitchmatologists” out there with the latest craze. If you hear a new one, run it by us and we’ll see if we can break down the logic. As always ask questions when it stops making sense. Enjoy! There are many people all over the country that practice hair (like how I dressed that up?) out of their kitchen as nothing more than a way to make money. Let’s start off by saying that at its core there is nothing wrong with letting an experienced friend style your hair. There are also stylists that work in salons that refuse to attend any shows, don’t get more than the required continuing education credits who pose just as much of a threat to your hair health. Ok, Where did this come from? I took off yesterday to read around the WordPress community and see what’s the current buzz. I happened upon Hair Carer’s blog, which is pretty cool, and remembered a conversation that a hair school instructor held with me a while back. A hair license is not proof positive of anything other than a person sitting through requirements. Professionalism revolves around how seriously one invests in constantly learning and growing. Her term for people who didn’t take that time is, Kitchmatologist. You should be able to engage in intelligent dialogue regarding hair with whomever you entrust to aid in your hair’s health. The questions that you ask of Ooohmyhair.com, you should be able to get a well thought out answer from behind the chair as well. If that is not the case, and you feel like you’re never able to maintain a look/feel between visits, leave. I know that seems harsh but if your doctor never answered questions about your body’s health you’d be uncomfortable I’m sure. Your hair is not only your crown, but beyond the aesthetics, as we always discuss, your scalp is a gateway. The product additives that we’ve discussed previously in, Clean Curls 101:Poo Basics, and What’s the Deal with Shea? , the harm that they can potentially cause to your health happens through absorption into the scalp. You want to know the methods and philosophy your hair professional may hold since they have so much access. Prior to your next appointment (Dads on duty, this goes for you too), write down at least three new questions to ask your hair care professional. There is nothing wrong with them not having the answer immediately, but they should be willing to research and return with something helpful. It’s not a test of whether or not they know everything, that’s impossible, it’s a test of whether or not they care to keep you informed. If not, you may have identified a Kitchmatologist…. Run! First, the purpose of cleansing is to remove build-up and allow the hair to breathe and absorb nutrients essential for healthy growth. Cleansing also allows the hair to return to a stable pH balance and in doing so reduce opportunities for breakage. The frequency of cleansing should coincide with the amount of build-up present. If styling with products that contain waxes, heavy oils or holding agents the hair needs to return to a stable pH in no longer than two weeks. Prior to selecting a cleansing method determine the current state of your hair. If to the touch your hair feels delicate (you just removed long-term braids, used a styling product that had a drying properties, etc.) you should use a hydrating shampoo. If your hair feels oily in a bad way, you should seek a gentle clarifying shampoo followed by a cream conditioner. 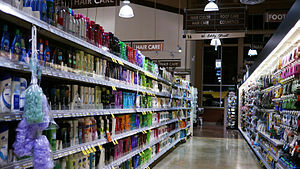 Try to avoid products that contain parabens, EDTA, as stated in the What’s the Deal with Shea? post. My product suggestion is Onesta, their products are free of most of the harsh chemicals and additives found in many shampoos. We know that last one may be a bit much for Dads on duty for the first time (think four ponytails but twist the hair down into buns, not too tight, let the clips hold them). It may seem like things you already know, but this is where lots of damage takes place and extra work created by not giving this step the attention it deserves.Remember that shampoo is not your only option in cleansing. As always ask questions when things stop making sense.